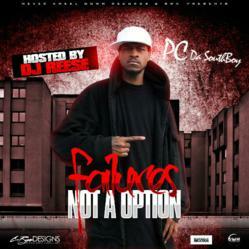 Coast 2 Coast Mixtape Promotions, Never Kneel Down Records, and SWA Present PC Da Southboy’s Latest Mixtape Project, Entitled “Failures Not A Option.” Hosted by DJ Reese, it is Available for Free Download From Coast 2 Coast Mixtapes. PC Da Southboy started writing songs when he was just 7 and recording at the age of 14. He got serious about pursuing his music career at 17 and has been working at it ever since. Now 24, he already has a follow-up mixtape to “Failures Not A Option” scheduled for release, entitled “Full Grown Beast Vol. 1.” He also has a single coming up from “Dirty South Side,” an EP that will soon be released.